When you become a mum household chores are a constant thorn in your side. Somehow you never manage to get everything done, the washing builds up or the polishing doesn't get done, or you end up with a mountain of ironing to do. I've worked out how to get on top of those pesky household chores. Much like the dieting motto 'eat little and often' if you do small household chores every day then sooner or later they'll all be done. For the last week my kitchen worktops have been spotless. I've managed to keep them clear for an entire week, usually unheard of. I'd kidded myself that I didn't have the time to get everything done in a day. There were just too many jobs that needed doing and I would never finish it all. It's all about when you do it. I use slots of time that would usually be filled with me sitting on my bottom drinking a coffee, to get on top of the household chores. AND I manage to have that coffee! 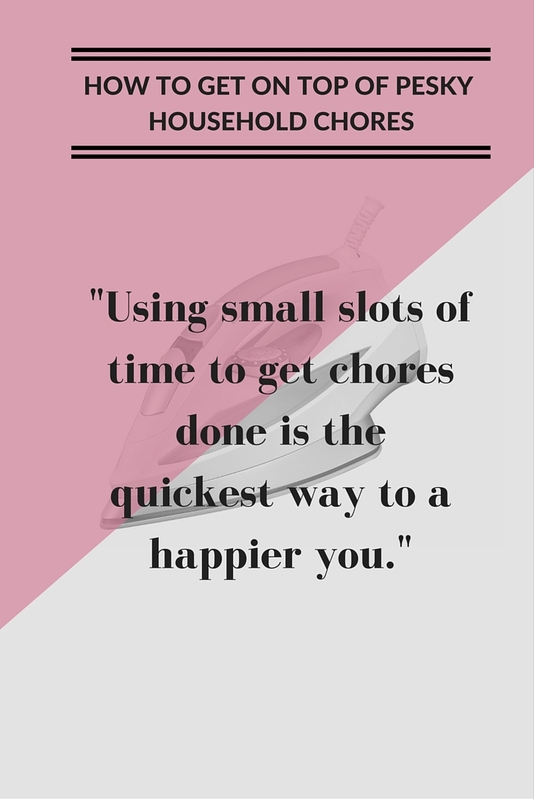 Use short slots of time to get small chores done. While waiting for the kettle to boil, fill the dishwasher. While waiting for bread to toast, put the washing in. While the kids are eating breakfast, wipe the kitchen worktops. Cooking dinner gives you that time too. While you watch the meal cook on the hob, or put it in the oven, wash dishes or take dirty washing into the utility room (or wherever you keep your dirty washing). Allow yourself 15 minutes every day to do ironing. In that 15 minutes you'll get a few items done and the pile gets smaller. If you're anything like me tackling it all once never works, I just put it off. By using time efficiently I've been able to get on top of my household chores. I can't tell you how happy it makes me to walk into the kitchen and see a sparkling worktop rather than a worktop filled with dirty dishes. There are still piles of dirty washing around the house, still plenty of jobs to tackle, but as I work my way through these jobs I can see progress. The piles (both washing and ironing) are getting smaller. The dishes are all away in the cupboards. 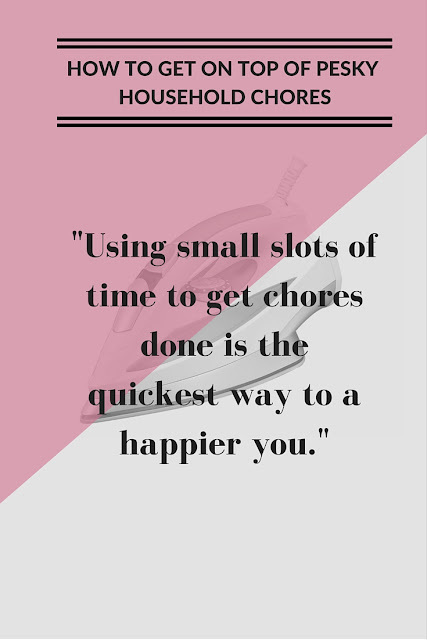 Using small slots of time to get on top of pesky household chores is the quickest way to a happier you. What top tips would you give to get on top of household chores? Get freebies and read more from me! Brilliant post and wise advice. I could have done with this a few days ago before attempting a mammoth clean with two tots in tow. Thanks for the tips and I'll give it a whirl. Those are fab tips. We tend to just leave it until the boy is sleeping but it's tough when I'm tired. Our solution with regards to ironing is not to iron. My wife is the laundry queen and somehow does something that means most things don't need ironing. Thanks so much for linking with #fartglitter.